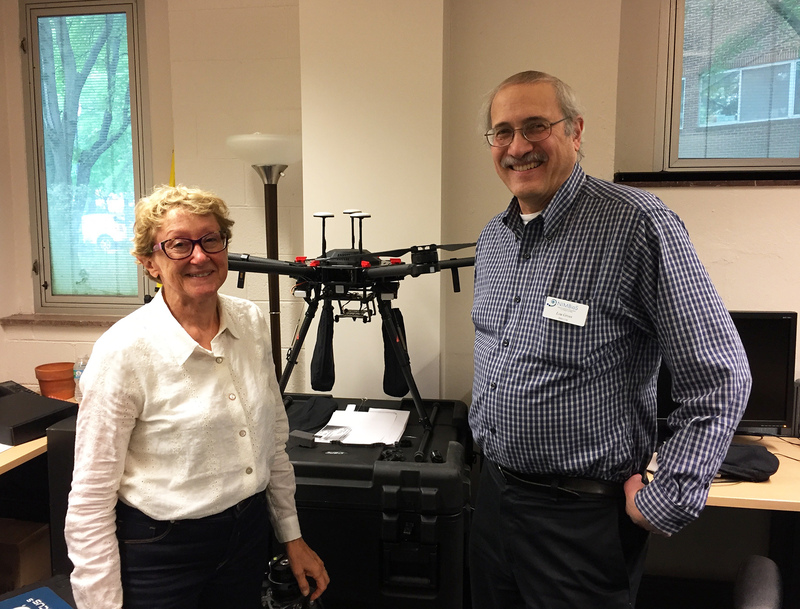 CESAB Director Alison Specht visits the drone at NIMBioS’ Spatial Analysis Lab with Director Louis Gross. New collaborations and conversations about future directions took place last week at NIMBioS with a visit from Alison Specht, the director of the Centre for the Synthesis and Analysis of Biodiversity (CESAB) in Provence, France. Specht met with NIMBioS Director Louis Gross to discuss possible projects and how the plans for NIMBioS sustainability have led to the development of the National Institute for STEM Evaluation and Research, the Spatial Analysis Lab, and the Center for the Dynamics of Social Complexity. They also compared recent papers that each co-authored using theories for human behavior to investigate impacts on data reuse (Specht) and climate change (Gross). Specht was visiting the University of Tennessee to continue work with DataONE, the Data Observation Network for Earth. This entry was posted in collaborations, research, SAL and tagged research. Bookmark the permalink.